Stout beer (or porter) --- 3-1/2 Tbsp. Worcestershire sauce --- 1 tsp. Green olive --- 1 ea. Hen egg, free range (garnish) --- 1 ea. Combine all the ingredients in a mixing glass, stir and pour into a short tumbler over cubed ice. Pierce the olive with the rosemary and rest on the rim of the glass. For the egg yolk garnish, gently separate the yolk from the egg white (the latter can be discarded) and place in a mini serving bowl, or large spoon. 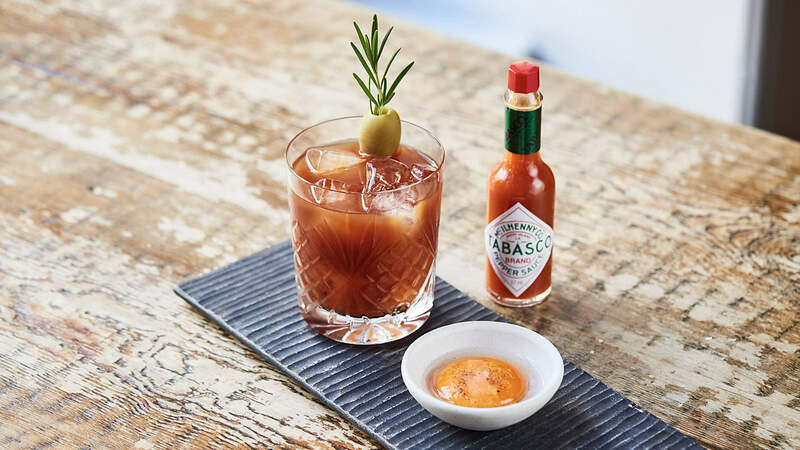 Add a dash of vodka to the yolk followed by the TABASCO® Sauce. Finish with a pinch of salt and pepper and serve alongside the cocktail.